What is the difference between the transferable license, and regular (static) licenses? The regular (static) Print2RDP license is tied to a computer, therefore even if one bought a new computer, the Print2RDP cannot be reinstalled and registered on this new computer, since the license is already in use. The second license option; the transferable license, validates the license periodically, and it is not tied to a computer. If you would like to move your already registered Print2RDP to a new computer, you can do it very easily by following the steps described in the Moving transferable license to another computer section. For more information about the transferable licenses, please refer to the Registering the Print2RDP with transferable license section. Please note, that Print2RDP tries to validate the transferable license periodically over the internet, therefore you must have an active internet connection at least once in a month! Please note that manual (offline) registration is not supported with transferable licenses! 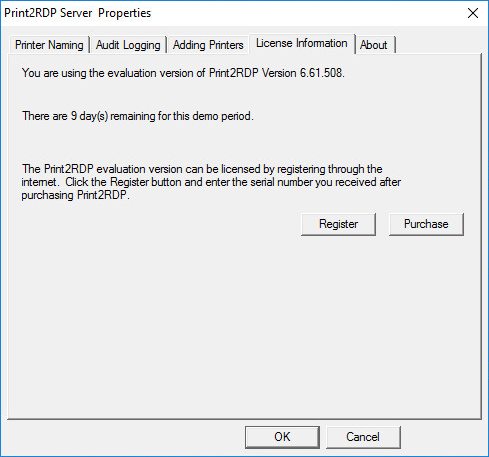 To register the Print2RDP during the demo period, open the Print2RDP Server > License Information and click Register (administrator privileges required). Enter the serial number in the text field and press OK. The serial number is in the body of the email containing download instructions for Print2RDP. NOTE: An active internet connection is required in order to license the software. Manual (offline) registration is not supported with transferable licenses! The serial number contains dashes that are part of the number. The software will register over the Internet connection via Port 443 (HTTPS) to query the Black Ice license server and verify that a valid serial number was entered. How do I know if Print2RDP is registered with transferable license? 1., Contact sales@blackice.com with your current Print2RDP serial number, and they will make the necessary changes to convert your serial to static serial. 2., Once our sales department has confirmed and provided your transferable serial, go to Print2RDP Server > License Information > Register with different serial button, and register the product again with the static serial number. NOTE: If the computer is not connected to the internet, one can perform manual registration to register the product. When performing manual (offline) registration with transferable license, the license will be automatically converted to static license. 3., When the registration is finished, check if your license is not transferable based on the description of How do I know if I have transferable license? 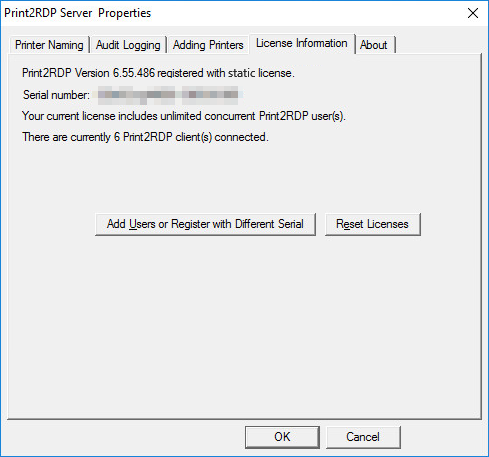 If everything is worked properly, Print2RDP now registered with a static license. If one would like to convert a regular (static) license number to transferable, please contact sales@blackice.com. 1., Contact sales@blackice.com with your current Print2RDP license number, and they will make the necessary changes to convert your license to a transferable license. 2., Once our sales department has confirmed and provided your transferable license, go to Print2RDP Server > License Information > Register with different serial button and enter the new transferable serial number. NOTE: For registration, the computer must have active internet connection. Manual (offline) registration is not supported with transferable licenses! 3., When the installation and registration is finished, check if your license is properly transferable based on the description of How do I know if I have transferable license? If everything is worked properly, Print2RDP now registered with a transferable license. For more information about the benefits of a transferable license, please see the Registering the Print2RDP with transferable license. In order to move your already registered Print2RDP to another computer, please make sure that you have transferable license based on the description of How do I know if I have transferable license? 1., To move the already registered Print2RDP to another computer, uninstall the product from Control Panel on the computer to unregister the license. 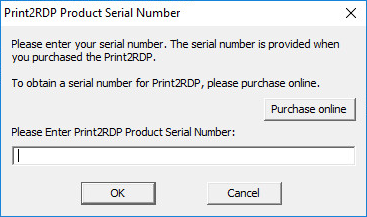 2., When the uninstallation is complete, install the Print2RDP on the new computer, and register with your serial number. If the Print2RDP is not registered with the transferable license, then you can contact sales@blackice.com to obtain a transferable license. Transferable license requires online validation once in every month. If Print2RDP is registered with a transferable license, then the Print2RDP attempts to connect to the Black Ice License server via the internet, and validate the license. For the validation, the Print2RDP requires active internet connection on the computer, for at least once in every month. In order to make sure that your license is validated, please enable the internet connection on the computer, and restart the Print2RDP to initiate the license validation at least once in every month. The validation is an automated process; Print2RDP will only notify the user about occurring errors. In order if your computer is not connected to the internet for more than a week, Print2RDP will notify you from the days left to validate the license. Click on the OK button to continue using the Print2RDP. Print2RDP remains fully functional and can be used until 30 days without online validation. Proxy Settings can be used to configure a proxy server to access the Black Ice License Server for the validation. One can attempt online validation by clicking on the Retry validation button. Before retrying the online validation, please make sure that your computer has active internet connection. 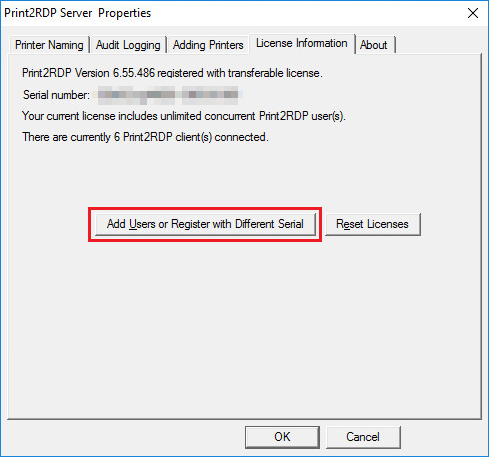 Clicking on Register with different serial allows the Administrator to register the Print2RDP without active internet connection, due to manual registration. Please be aware, that after the manual registration, the license will not be transferable anymore! This option is recommended in highly restricted environments without internet connection.